An elephant in Kenya trampled and killed an American woman and her baby daughter, a wildlife spokeswoman said. 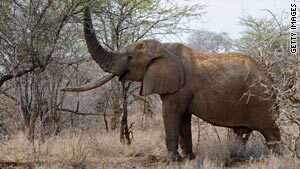 Nairobi, Kenya (CNN) -- An American woman who was trampled to death by an elephant in Kenya, where she lived with her family, was a librarian who was determined to see that schools and libraries be built in poor villages, a former boss said Wednesday. Before moving with her husband to the Kenyan capital of Nairobi in 2006, Sharon Brown was a reference librarian at Antioch University New England in Keene, New Hampshire, said library director Marcy Leversee, who hired Brown in 2005. Brown and her toddler daughter, who also died in the incident, were on a guided forest hike Monday near the Castle Forest Lodge, about 65 miles north of Nairobi, when the incident occurred, said lodge spokeswoman Melia Van Leer. Van Leer speculated the elephant was in a herd of about 20 that were spotted later in the day with their calves. Elephants can be particularly defensive when they are sheltering their young, she said. In Nairobi, Brown was a librarian at the International School of Kenya, according to a security guard at the school. Her husband, Jeff, worked there as a fifth-grade teacher, according to the school's Web site. Sharon Brown only spent a year at Antioch, Leversee said, because when she got the opportunity to work in Kenya, she felt it was a chance that was too good to pass up. At Antioch, she worked with graduate students in environmental sciences and clinical psychology. "Sharon was a quiet, open person. Very present," Leversee said. "She believed that every exchange was a mutual learning. She opened the exchange by listening. "She was a cherished colleague," Leversee said. "To me, she was a citizen of the world in the finest sense." The Browns became passionate about Africa after serving in the Peace Corps, Leversee said. That was where Sharon Brown became committed to promoting education. Leversee said she didn't know where they served, but Sharon Brown "had an affinity for Africa." Brown had said that while in the Peace Corps, she totally immersed herself in the culture of the villagers, even asking the women to teach her how they washed clothes. A Peace Corps supervisor told Leversee that Brown provided the women and children with their very first books. Leversee said she didn't know the name of the village. According to Van Leer, the property around the lodge is full of elephants, but encounters with humans "don't normally end in tragedy." There have been no tragic incidents with elephants in the area since 2001, she said. "This area has wild animals, and I always warn my clients and everyone else to be aware of the danger," she said. "But from now we won't allow children out anymore. The young child could have been saved." The U.S. Embassy in Nairobi refused comment Wednesday. CNN's David McKenzie, Melissa Gray and Deb Krajnak contributed to this report.